My name is Jolene and I am 34 years old, I have been playing the sims since the original. 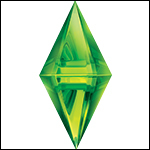 It seems longer ago then it really is, I suppose I was 15ish when the first sims game came out. I owned several of the expansions and stuff packs for the original game. For the sims 2 & 3 I had all the packs available for both games. I actually gave my sims 3 base game and packs to my brother when my sister in law let me know he liked to play. When the sims 4 came out I couldn't afford the game, bills were more important. I just bought the game in April when amazon was having a sale, I have one expansion (city living), Three game packs (Vampires, Dine out & Parenthood) & several stuff packs. I have to admit I spend more time downloading CC then I actually do playing the game. Besides playing the sims, I also enjoy blogging and website design. Both of which I have been doing off and on since my early teens. I love to read and write as well. Hello, Jolene. Welcome to the forum. We are pleased to have you here. That's amazing to meet someone who played the series from its very beginning as well. TS2 is still the best for me. @midnightjojo33 wrote: I have to admit I spend more time downloading CC then I actually do playing the game. That is so about me . But now as I've started 'treasure hunting' I know more places to look and what to look for. It became easier. It's so unusual to see a person who has been blogging for such a long time. How do you manage not to lose interest and motivation?